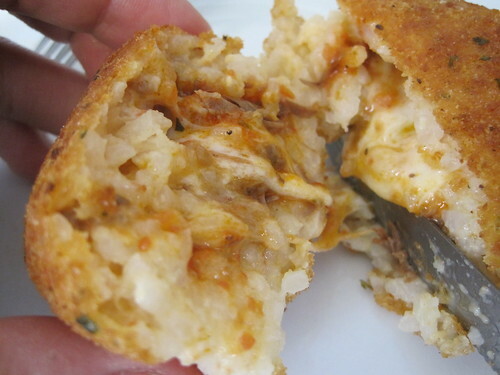 One of my favorite dishes at a local trattoria in New Jersey is an appetizer consisting of potato croquets, mozzarella in Carrozza (mozzarella sticks), calzoncini (friend pockets of dough), and arancini (rice balls). 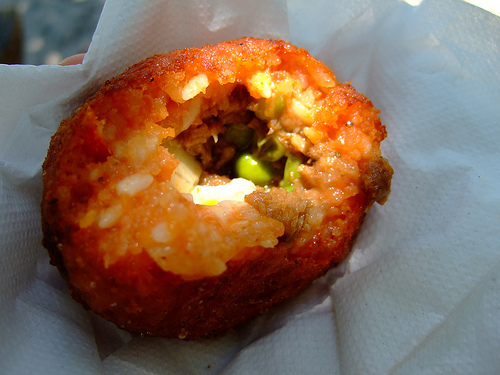 All of the items in the dish, officially called frittura Napoletana, are expertly fried and generally well executed. 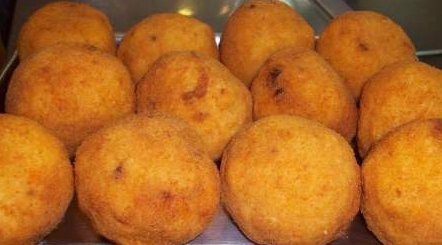 However, it’s the arancini that stand out and remind me of the fried treats I consumed on the Violet coast (in Bagnara Calabra) as a child (usually from street vendors or small pizzerias) during my summer vacations. Arancini are traditionally prepared with Arborio rice, tomato sauce with ground beef or pork, peas, and mozzarella (or another local cheese that melts well), coated with an egg wash, breaded, and finally deep fried until golden and the cheese is melted (click here for our arancini photos). The arancini of my youth were especially delicious after a day spent swimming in the Mediterranean with my cousins Vice, Maria, and Giuseppe. And while the grown ups scolded us for consuming “vile”, and fried, street food I wondered how they could compare melted cheese and creamy Arborio rice to the swordfish and roasted goat dishes they would later have for dinner (I later learned to love both swordfish and goat, of course!). My mother Annunziata continues the fried rice ball tradition in her New Jersey kitchen, though it’s become a once a year thing as the work to prepare arancini becomes more daunting with age (don’t tell my mother I said that). Annunziata’s State-side arancini do not differ widely from the Italian variant in both size and flavor (a rare happening when trying to replicate Italian dishes in the US) as she uses good ingredients, is meticulous about preparation, and most importantly, is an expert fryer. Make plain risotto and proceed to scoop out a healthy amount into the palm of our hand (you're looking for baseball size arancini; note they don't need to be perfect spheres, in fact, I'm used to seeing arancini with a more oblong shape versus something perfectly round). Make sure to wet your hands with some fresh water prior to handling the rice (this will prevent the rice from sticking). Make an indentation in the middle of the rice and proceed to fill the ball with a little tomato sauce, 3-4 cubes of mozzarella, and peas. Next, close the rice around the filling and seal the ball by shaping the rice into a ball. Beat a few eggs and season them with a bit of salt and pepper. Next dip the rice ball into the egg mixture and then in a bit of flour. Thereafter, dip the ball back into the egg mixture and then into fine breadcrumbs (buy fresh breadcrumbs from a local shop that are not seasoned; you can season your own breadcrumbs with salt, pepper, oregano, and finely chopped parsley). Begin heating your vegetable oil in a large pot (no need to use Extra Virgin Olive Oil as Mario Batali used to do on his FoodTV cooking show, as it's a royal waste of money). The ideal frying temperature is between 350 and 375 degrees. You can invest in a thermometer like this, but after several frying sessions you'll get a sense of when your oil is ready. Gently place the balls in the hot oil and fry for about 4 to 4.5 minutes (depending on the size of the ball itself). Brings back memories of spending Saturday afternoon with my grandmother helping her make riceballs. And you’re right about eating them right away, they don’t retain their crispness after awhile. Nice post Vince. Thanks for the comment. Yes, I had the same experience with my grandmother in her NJ basement. She would call me over early on a Saturday morning and we would work the rice and fry the balls up in time for an early lunch. We would do the same with bread making. I miss those days with Nonna Rosa! Keep on reading and please share other memories about food and your family! I just wanted to say please be careful with writitng degrees Celsius or Fahrenheit. 375 degrees Celsius (the frying temp given in the arancini recipe) is WAY HOT, like 700 degrees fahrenheit. I know that you say to wet your hands before handling the rice balls, but how to keep them from falling apart in your hands while you’re shaping them and adding cheese? I’ve worked with both fresh made risotto and leftover risotto with not so good results. Not sure what I’m doing wrong. If you’ve got suggestions, let me know! Thanks for the comment. I usually make sure my risotto comes out extra starchy when making risotto. If your rice is too wet or contains too much liquid it will fall apart (took me about 7-8 tries to get the right consistency). You’re basically looking to overcook the risotto a bit to develop the starch that will help keep the ball together. 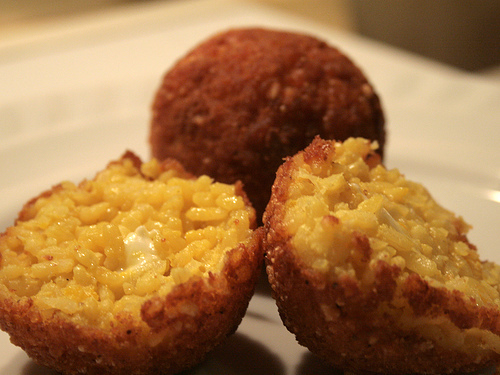 You can also make the rice and then put it in the fridge and make the balls the following day (this is how the first arancini were made, basically as a left over dish). Absolutely one of my favorite treats! When traveling to Italy, I always have them as soon as I can find them! I will definitely try your recipe. I make something similar with regular white rice. I would love to try them using arborio rice. Hi Gianna, try the arbrorio rice as it has more starch and will make the end product much better! Thanks for the “Print” LInk!!! !